People often talk about bullying. But what is bullying? 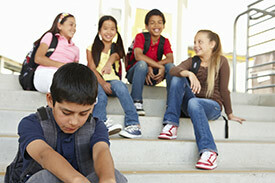 Bullying happens when one person or a group of people repeatedly harms another person. Bullying is not a single event. It is not an accident. One way to recognize bullying is to notice the difference in facial expression and body language between the person who is bullying and the person who is being bullied. This activity will help you recognize bullying. Your Turn Tell which events are bullying. Explain your answer. A student constantly makes fun of another student's clothing. Three students keep passing around mean jokes about another student. Two people accidentally run into each other during dodgeball. A teacher often makes fun of one particular student in front of the class. Players on one team say they will win against players on another team. A mom makes her son take medicine for a stuffy nose. One student often takes pencils from another student without asking. Three students threaten to fight another student after school. Someone keeps posting mean things online about someone else. Two friends enjoy trading insults as they eat their lunches. Recognizing Bullying by Thoughtful Learning is licensed under a Creative Commons Attribution-NonCommercial-ShareAlike 4.0 International License. Based on a work at k12.thoughtfullearning.com/minilesson/recognizing-bullying.